With 24 out of 28 members rating it 4 or 5 stars, Alice I Have Been is a clear winner with our readers, and inspired many to revisit Lewis Carroll's classic. A great choice for book clubs, this controversial book will certainly inspire heated discussions. Melanie Benjamin weaves historical anecdotes, her impressions gleaned from an art exhibit of Dodgson's photography, and her incredible imagination to take the reader on a journey beyond the looking glass into the reflections of "the real Alice." Looking back over her 80 years as the most famous little girl in England, Alice Liddell Hargreaves struggles to come to terms with her relationship with Charles Dodgson and the story she urges him to write down for her. Benjamin skillfully captures the voice of Alice at each of three stages in her life and gives the reader no more information than Alice herself would have had or let herself acknowledge. The result is a highly engaging, very satisfying narrative adventure that sensitively and believably provides a richer perspective on this famous literary duo (DawnEllen J). Going back in time with the real Alice is like going down a new rabbit hole with experiences following one upon the other until the final page of the imaginative roller coaster ride. A very enjoyable and often poignant adventure story with a curious twist at the end (Therese X). I had some vague idea that Alice in Wonderland was indeed based on a real girl. 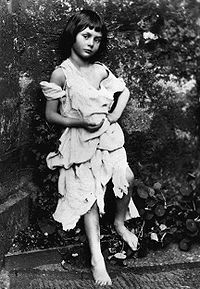 What I didn't realize, however, was that Charles Dodgson, better known as Lewis Carroll, knew Alice Liddell quite well and even photographed her extensively when she was a young girl. Dodgson and Alice understand each other and have an emotional connection that, while not altogether inappropriate, often teeters on the edge of an intimacy that could be disturbing. It is this strangely close bond that threatens to tarnish Alice's reputation and follow her forever (Anon). I have been stymied since reading this book trying to decide whether or not I liked it! 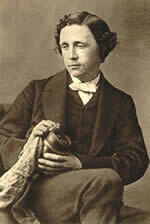 My recollection of the Alice in Wonderland story was warm and endearing. Now, my head is filled with worry about what really did take place between Mr. Dodgson and Alice when she was 11 years old. I felt a little like Alice falling into a rabbit hole myself after reading this book! "Curiouser and curiouser, indeed" (Marie D). I was uncomfortable with the relationship of Alice and Dodgson and that detracted from the book (PPM). While Alice is a mostly sympathetic character, Mr. Dodgson remains a cipher. Is he a sad, misunderstood man or a monster? Whatever the actual truth is, he gives me the creeps (Jeanne W). There is much here for book club discussion, especially the issue of Dodgson's attachment to little girls. Was it innocent? Is the discomfort experienced looking at his photos and reading his books carefully a product of our 21st-century sensibilities or does it transcend time and place (Barbara E)? Masterfully written, this "Victorian" novel will satisfy not only those who have been charmed by Alice's Adventures in Wonderland but any reader who enjoys history, mystery, and a journey through life's vagaries with a heroine whose admonition, borrowed from Lewis Carroll, is "May we be happy. (Carol C.)"
This review was originally published in January 2010, and has been updated for the January 2011 paperback release. Click here to go to this issue.